This promo recipe card is marked “FINGERTIP RECIPE CARDS T.M. NANCY SASSER” and was found in a large collection, date unknown. I’ve typed it below along with a scanned copy. 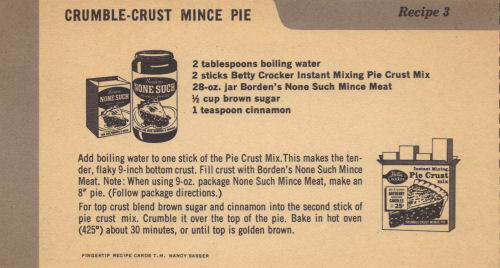 For top crust blend brown sugar and cinnamon into the second stick of pie crust mix. Crumble it over the top of the pie. Bake in hot oven (425°) about 30 minutes, or until top is golden brown.